When promoting a business, owners should ensure that they have an idea when it comes to the platform or medium that they will use. Marketing activities can affect the business a lot. This is the reason why marketing and advertising tools shall be created in a well-formulated and properly thought of manner. A time-tested marketing tool is a flyer design. This document can be made for a variety of purposes, giving your business a boost of foot traffic included. 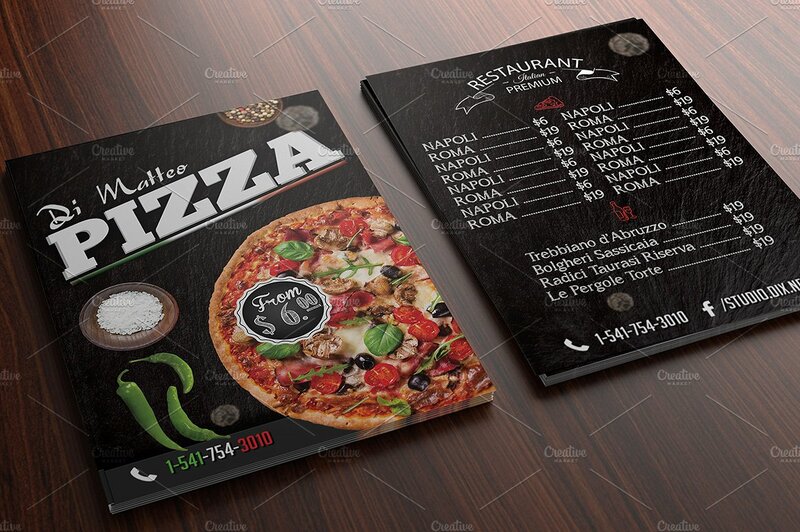 If you plan to create a pizza flyer for your restaurant, you have to ensure that you can present your business and its operations in the best way possible. Multipurpose flyers have been used for the longest time to promote a product, a service, a business or even a person. Since you will use a flyer to market your pizza business, the responsibility to come up with a striking and informative document is in your hands. For it to be easier for you to create the layout and content construction of your pizza flyer, we have listed samples of the specified document to be your guides. 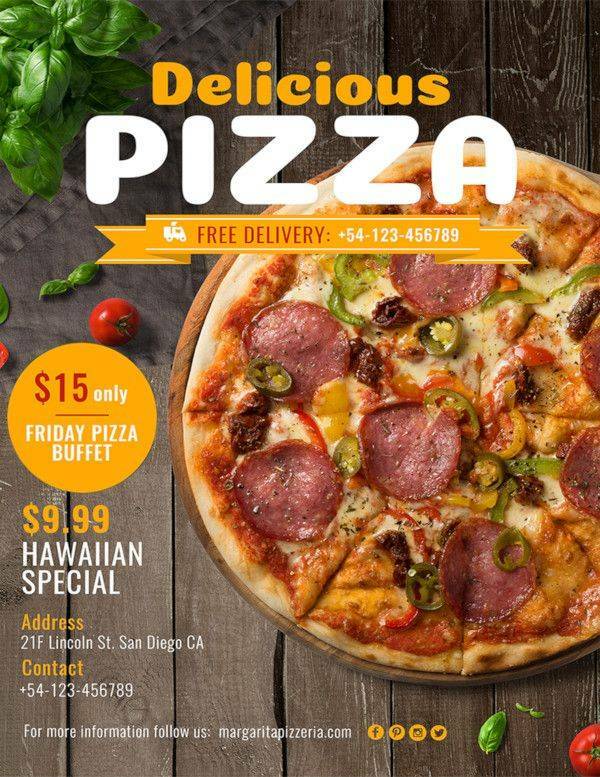 Get references on how the pizza flyers in this post have been made and identify the particular pizza flyer design which you think will work best for your business. Why Should I Use a Pizza Flyer? Pizza flyers, just like retro flyers and all the flyers out there, can be used for different purposes. Marketing departments or the people who are tasked to promote the pizza business are commonly the entities responsible for identifying the reason on why a pizza flyer is necessary to be developed. 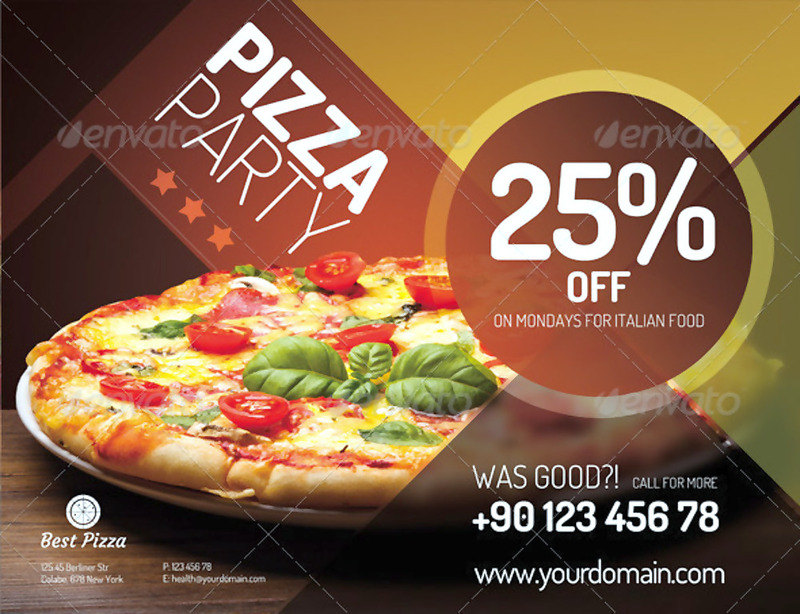 Pizza flyers commonly include information about the business and what it can offer to the consumers. 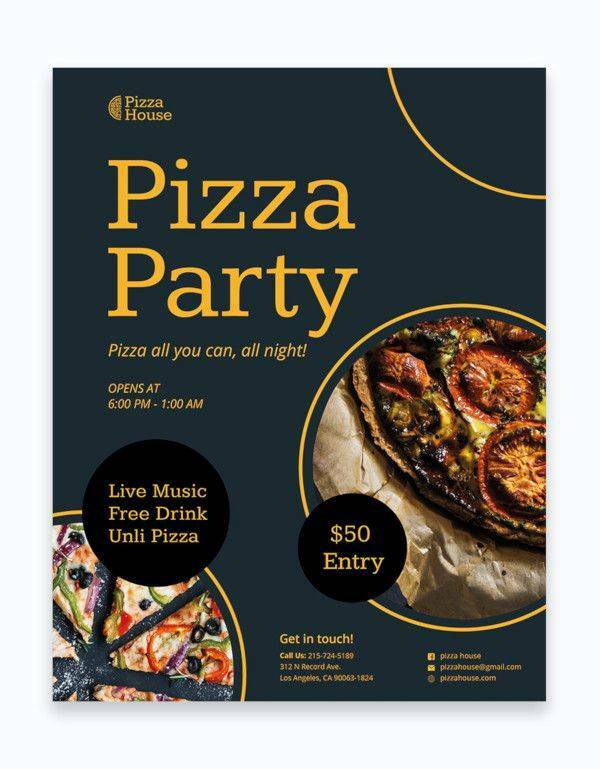 Since you want your business to stand out, you have to ensure that the pizza flyers that you will disseminate are unique and related to the aesthetic and operational values of the business. Listed below are some of the common objectives of making pizza flyers. To give the market an idea of what the pizza business is. Running a business is not an easy task. You have to show your target market that you are capable of providing their needs and wants. Since market demand varies from market niches to another, you have to develop a document that can specifically target the desires of your prospective customers. 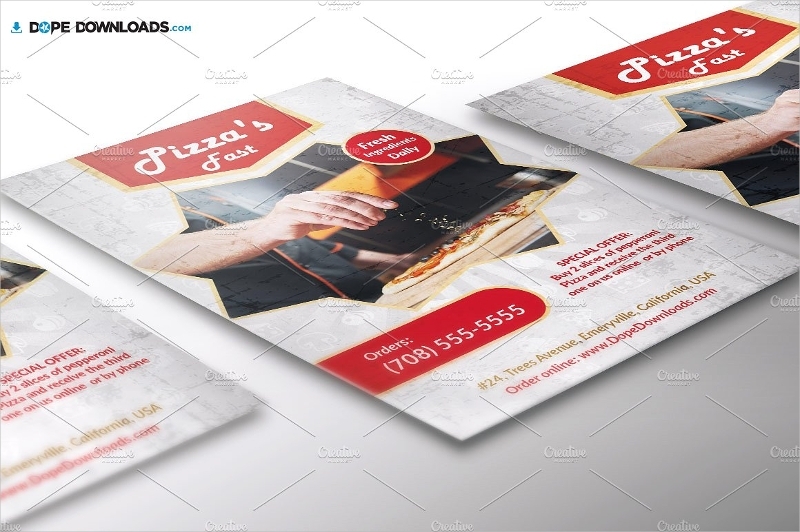 Through the help of a pizza flyer, you can present the brand image of your pizza business so that it can get appropriate and proper attention which can then lead to sales generation. 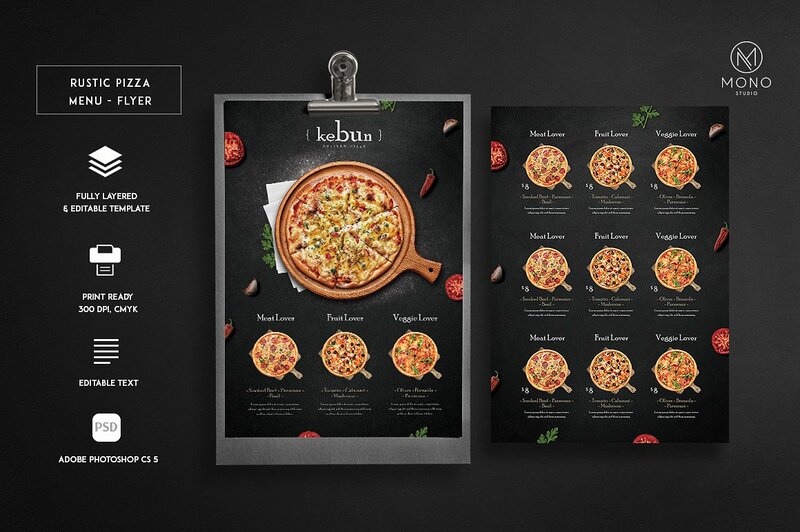 To present the menu selection of the pizza business. A pizza flyer can also introduce the products of the pizza business. 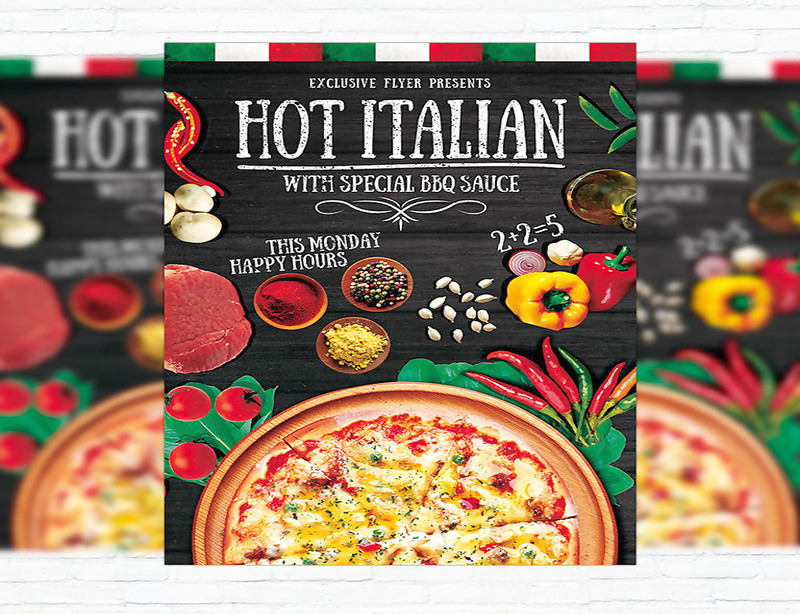 Depending on how you will design the pizza flyer, you can easily give the market a general preview of the pizza flavors that you have in store. More so, you can list the kind of pizza options that you can offer like the particular crusts that your pizza selection has or the toppings and flavors that your customers can select from. To ensure that the pizza business can separate itself from competitors. One of the main advantages of coming up with a pizza flyer of your own is that you can strategically give an idea of the business to the people. With originality, you can set your business apart from your direct competitors. 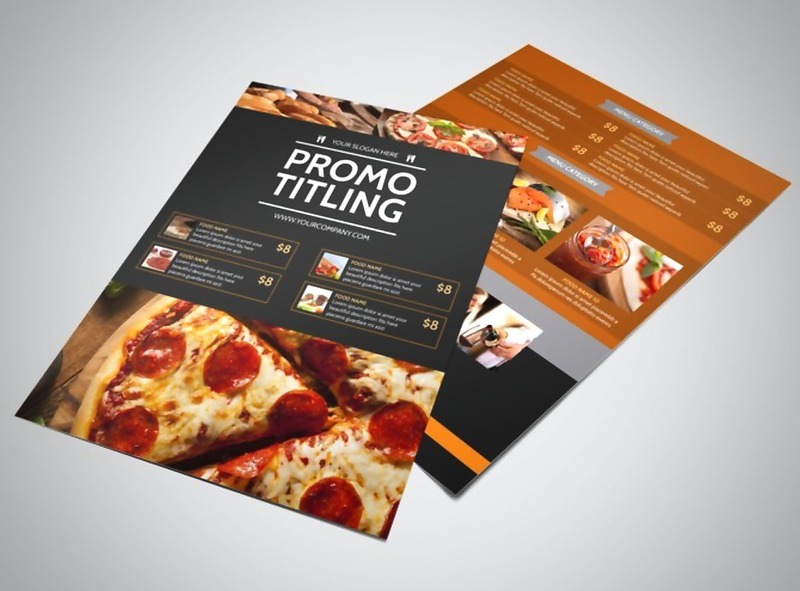 The layout, content, and even the colors of your business flyer can add to the branding of your pizza business. To relay other details that are necessary for new market acquisition and customer retention. Aside from your brand and products, you can add information in the flyer especially if you think that these details can give you a healthier relationship with your consumers. As an example, you can provide details about the health benefits of your pizza selection if you plan to target vegetarian and health-conscious customers. This way, you can present your business as an entity that is not only money-centered but one that approaches the business-to-consumer transaction as holistically as possible. Pizza flyers are easy to create. Coming up with a pizza flyer is way easier compared to developing a television ad. All you need to do is to come up with a theme and realize it by putting together a number of design items and materials. Pizza flyers are cost-efficient. 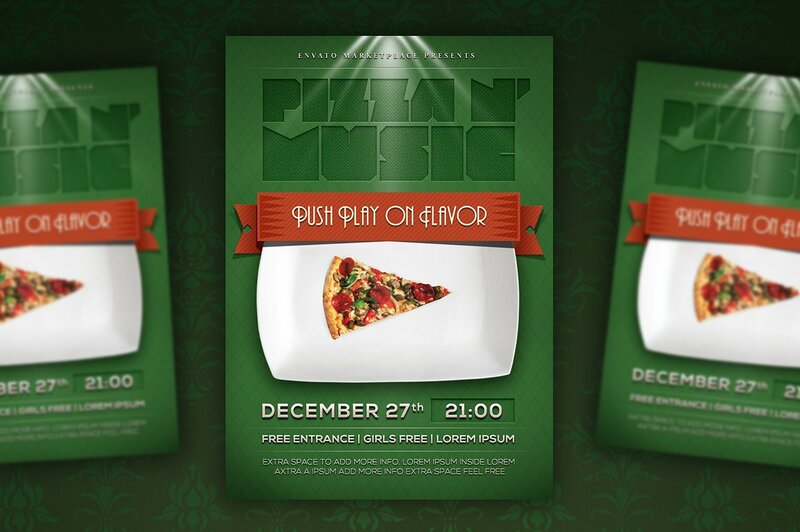 Once you already have the final design that you will use for your pizza flyer, printing it will already be an easy task. You can produce different sizes of pizza flyers even in the comfort of your own office. You can save a lot of money if you will use pizza flyers rather than investing on electronic advertorials and billboards that could cost you a lot. Branding can truly be costly, and having this kind of tool can help you reduce your spending as a business entity. Pizza flyers are multi-functional. As we have specified in the discussion above, you can use pizza flyers in a lot of ways. 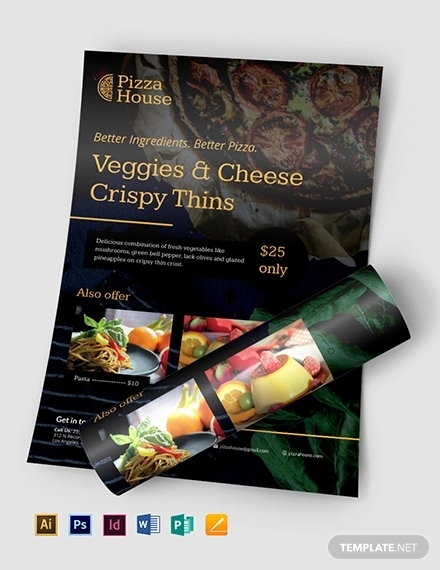 As a marketing tool and an example of a product promotion flyer, your pizza flyer should be able to reach the spectrum of consumers that you plan to target. 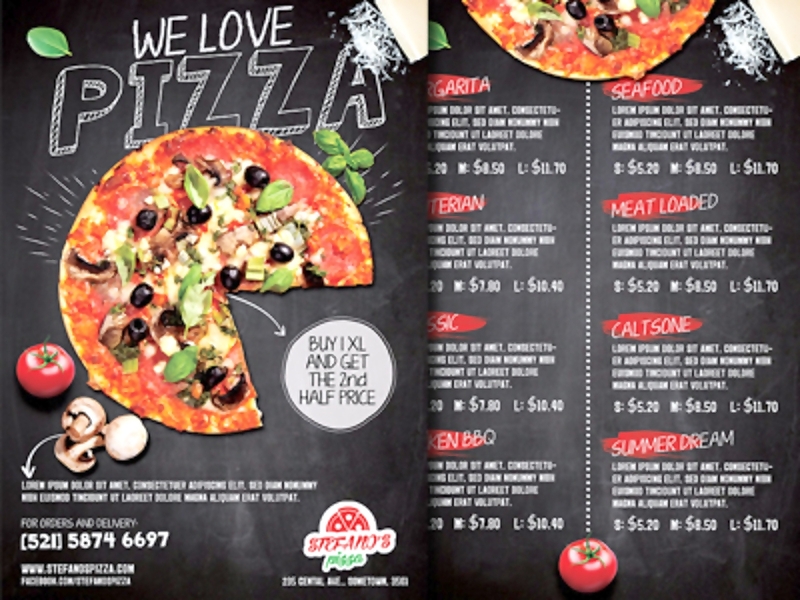 Different pizza flyer designs or those with a variety of content can help you use flyers in more ways than one. Pizza flyers are effective touch points. Having impressive touch points can help your business a lot when it comes to branding and marketing your goods. Pizza flyers are both seen and touched by your consumers. With this, they can have a physical touch point that can help them remember your business even for a long period of time. Pizza flyers are handy. Since pizza flyers are printed on board, specialty papers, or normal bond; pizza flyers can be carried by the people whom you give it to anywhere they go. This will allow the document to have a farther reach compared to other kinds of marketing tools. If you can promote your business in this manner, there is a chance that more people will know more about your business even if you have not directly given them the flyer in the first place. 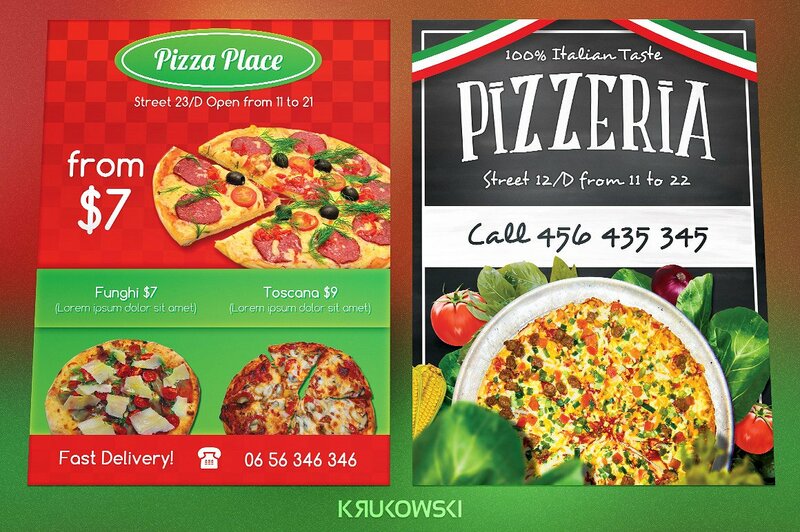 Pizza flyers, if well-designed, can give a perception of the business. Even if people have not stepped their feet on the actual premises of the business, they can already have an idea about the pizza business and what it aspires to be. 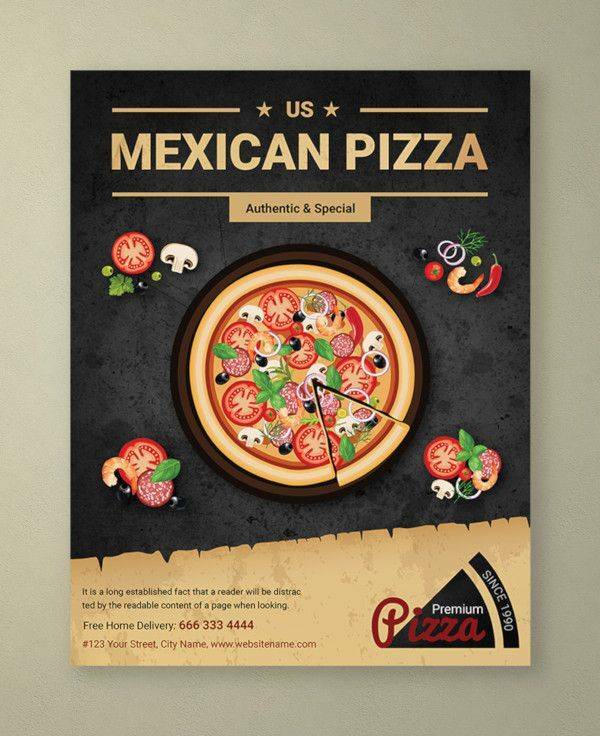 Using a minimal flyer design for your pizza flyer can help your business showcase its brand and image. Informative pizza flyers can help you lessen the impact of outside factors like competition and market threats. Since the pizza industry is a growing field of business, it is only imperative for you to be aware that competition is growing and becoming stiffer as well. 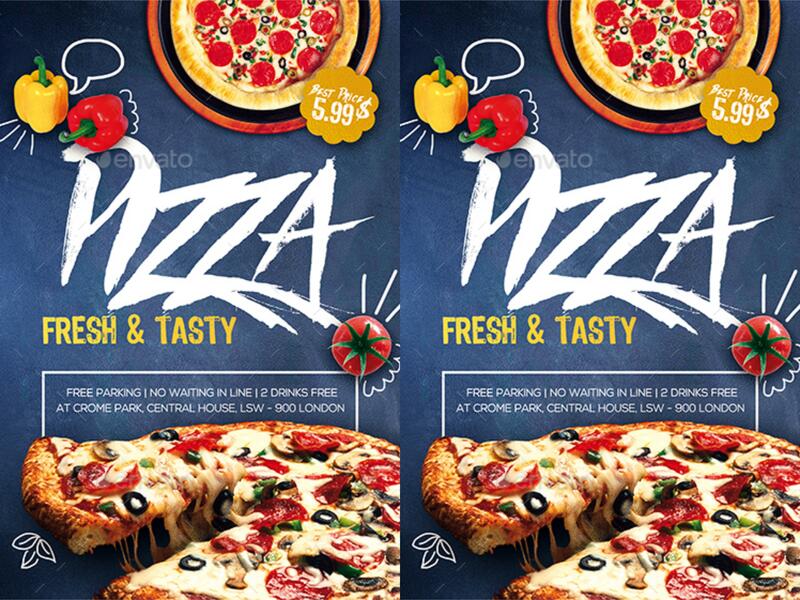 With the help of a pizza flyer, you can ensure that your pizza establishment can retain its image and that people who have trusted your brand will still let your business be their pizza establishment of choice. Having a pizza flyer is a part of your brand identity. If you will give effort and time in developing your pizza flyer, it will be easier for you to incorporate the core of the business brand into the marketing tool. Possible customers and loyal patrons can have a better grip on your branding if you can hand them with an updated pizza flyer. 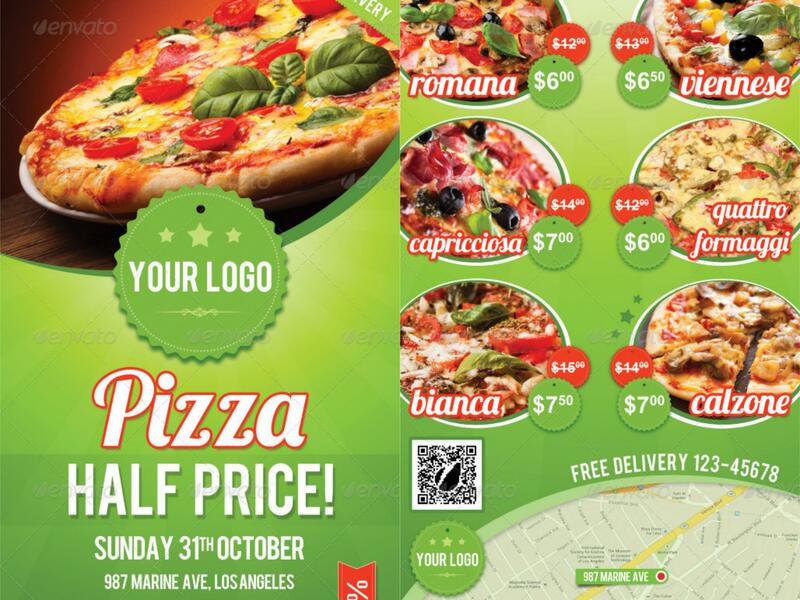 A visually attractive pizza flyer can help you get actual sales as it can attract people with your offering. Knowing that your pizza business can give what they want can encourage customers to try what you are selling. More so, it can give them an idea of your best sellers, your price range, and even the quality of the pizza that they can expect. Be aware of the reason on why you need to create a pizza flyer. You first need to have a goal in mind. Ask yourself, “Why do I have to use a pizza flyer and how can it help me with my business objective?”. Knowing what you want the pizza flyer to contribute to your business can make it easier for you to design and format it accordingly. Once you already have a purpose on why you need to create a pizza flyer, the next thing that you can do is to list down the information that you would like to present. Having a draft of the information that you want to disseminate can ensure you that you will not forget important details within the processes of developing the marketing tool. Before creating the actual layout of the pizza flyer, have a blueprint of the design that you want to achieve. 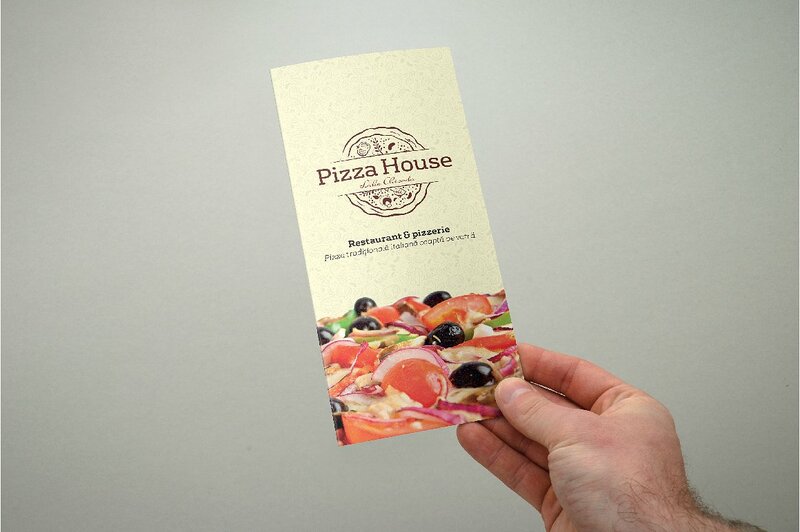 You can have a sketch of the pizza flyer that you envision so you can already have a guide when you are in the process of creating the design of your pizza flyer. Select the application or medium where you will create the layout of the pizza flyer. 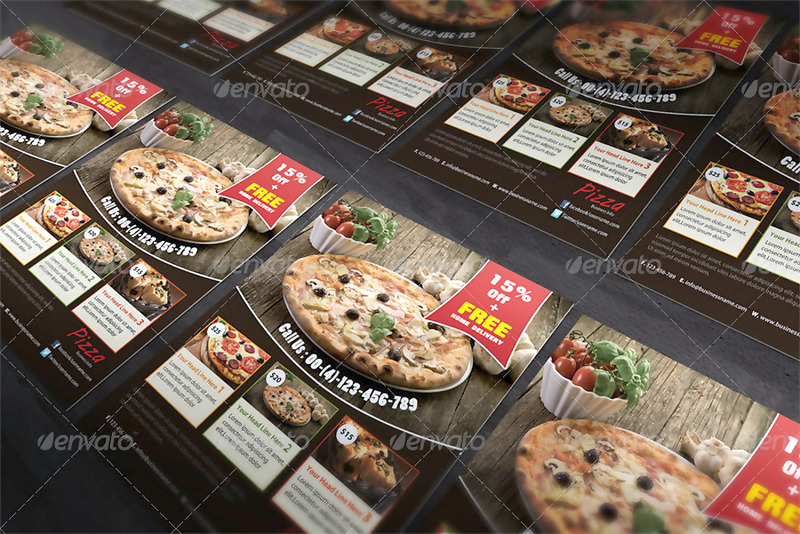 If you do not know how to create a pizza flyer from scratch, you can refer to samples and templates that you can easily download. 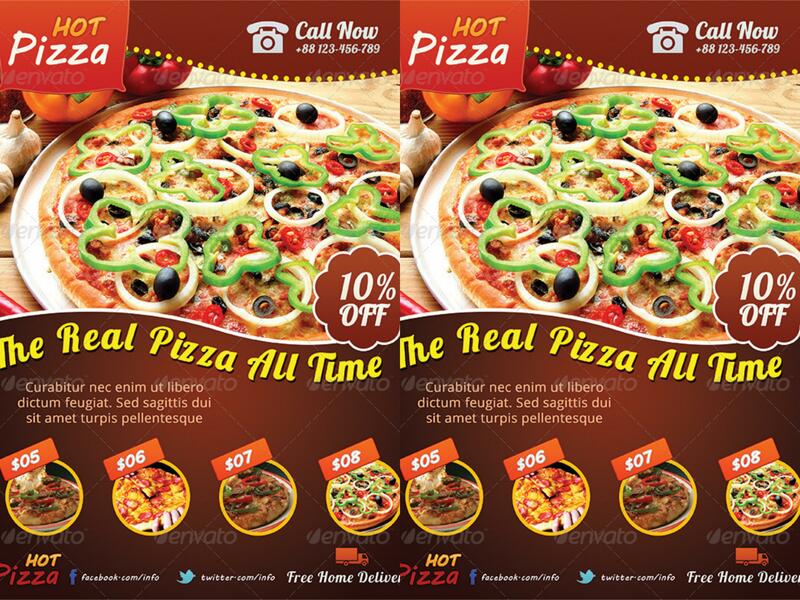 Always remember to edit the pizza flyer template that you will use based on how you want your pizza flyer to look like. With this, select a template that is closest to the design that you want to have. Place all the information that you want your market to be knowledgeable and aware of. Once all of these details are already present in the layout of the document, insert icons and images that will allow you to make the pizza flyer attractive and pleasing to the eyes. You can change the background and other design features from time to time depending on how the design will develop. Once you have the final design, do not forget to review it once again. Look for awkward spaces, grammatical errors and other technical or design problems that you need to take care of. This will allow you to correct these errors or mistakes before printing the flyer that you will use. Print the flyer and disseminate it based on how you have planned to. Ensure that you will get the comments and recommendations of your business partners and other stakeholders before actually using the flyer for marketing, branding and advertising purposes. The brand of the pizza business. 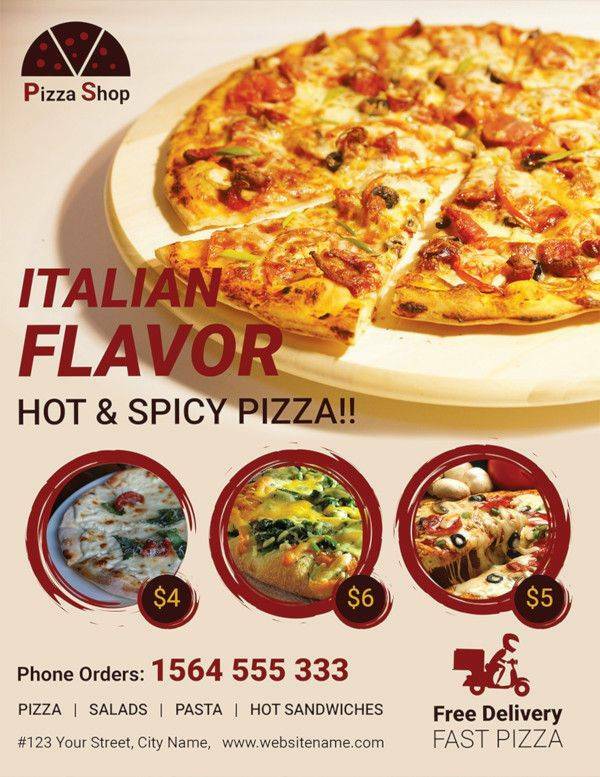 The image of your business is very important to be seen in the pizza flyer. Again, the uniqueness of the pizza flyer can reflect the originality of your pizza business. What qualities set you apart from the same business? What kind of pizza can you give your customers with that they could not get elsewhere? Prioritize your brand when developing the design of your pizza flyer. The color scheme or palette that the business is already known for. No matter if you are a new business or a pizza parlor that has already been in the industry for a long time, you have to make sure that the selection of colors that you will use for your pizza flyer should be related and identifiable, if not identical, to the color palette that your business uses when creating other documents and marketing materials. Being associated with a particular color scheme can help develop retention of your brand. The design items, images, and icons that you will put together. Pizza flyers are known to be very useful tools especially if you will use them appropriately. When developing a pizza flyer, you have unlimited resources of images, designs, and themes to use. With your creativity comes the responsibility to know when to limit what you would like to present. The design items that you will put together should look good when combined and you should ensure that your final pizza flyer will not look messy, cluttered or poorly designed. The size of the pizza flyer. The ability of pizza flyers to reach your target audience is already not to be questioned. However, with different demographics and markets come the variety of pizza flyers that should be created as well. When creating your pizza flyer, be aware of the size of the medium where you will print it. Always remember that the size of the pizza flyer can actually affect its usability, functionality and overall quality. The purpose of the pizza flyer creation. We cannot give enough emphasis on how the reason for the flyer creation should be one of the top items that you need to prioritize. To give you an example, a summer flyer can be used to promote the summer deals and promos of your pizza establishment. 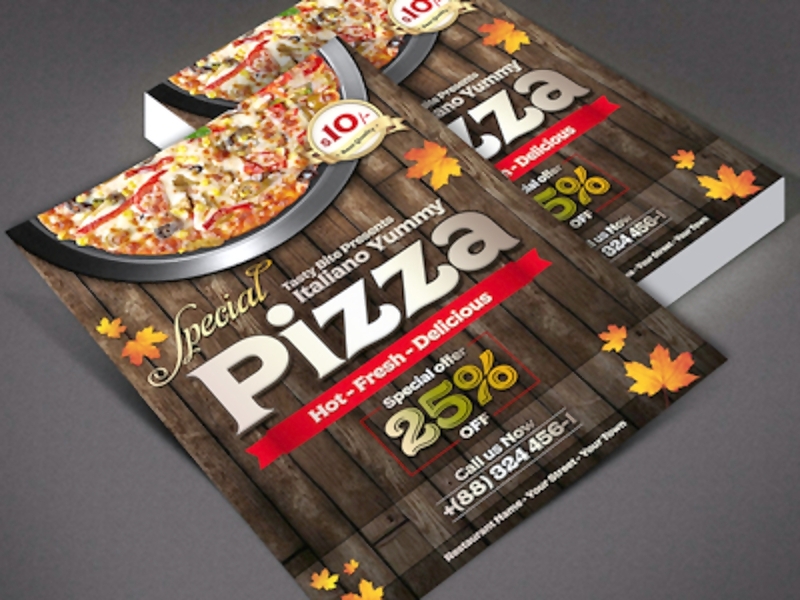 As marketing tools, your pizza flyers should directly answer your marketing and branding needs. 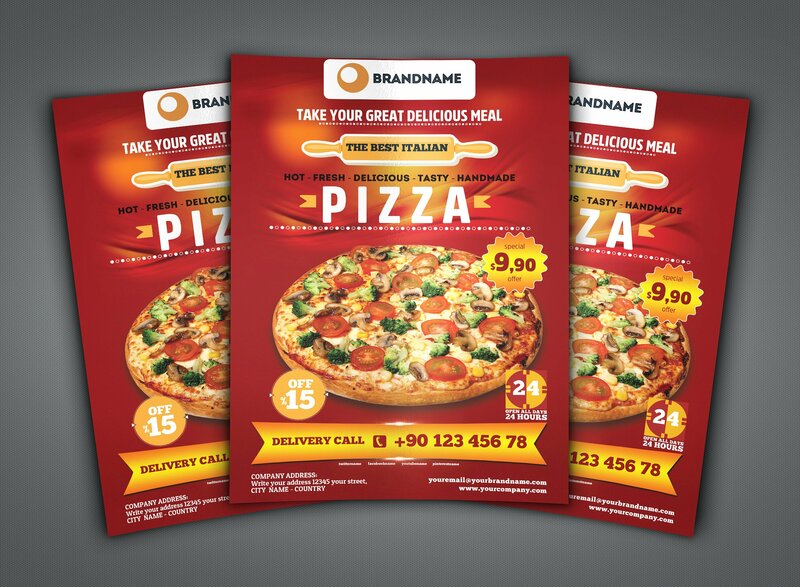 May it be to inform people about your deals and promotions or to target the market that you would like to penetrate, pizza flyers should be made based precisely on how you would like them to help your business and operations. If possible, seek professional help. There are a lot of digital developers and artists that can help you come up with the design that is suitable for your operations. 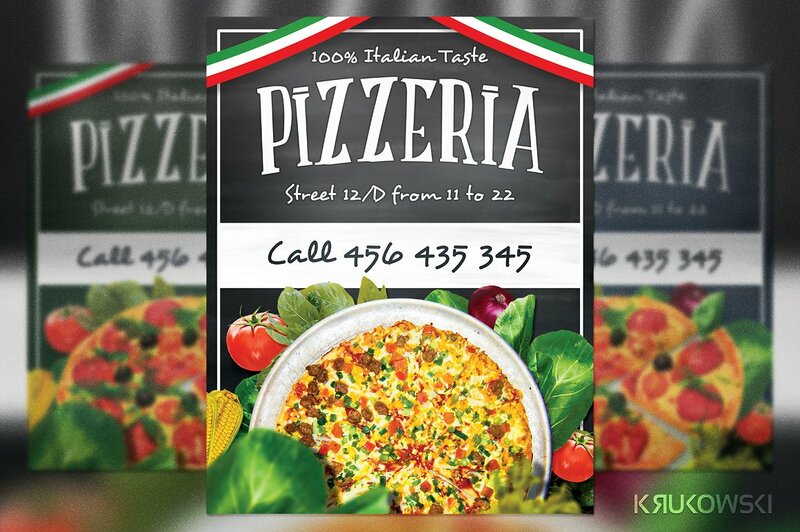 If samples and templates can not fully help you when it comes to designing a pizza flyer, make sure that there is someone who can guide you within the entirety of the pizza flyer design development. Do not be afraid to experiment. 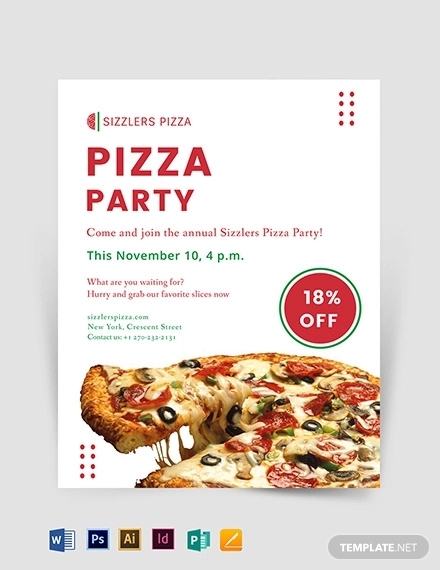 The more selection that you have, the more possibilities that you can come up with a pizza flyer that is best to be used for your marketing activities. However, you still have to narrow down your selections to a number that is healthy enough for you to have a clear vision of which pizza flyer design to use. As much as possible, limit the information that you will place on the pizza flyer. A lot of unnecessary information can disinterest the people whom you target to give the pizza flyers. This is where the purpose of the pizza flyer comes in. Depend on the content of a particular pizza flyer depending on how you will use it. As an example, event flyers that your pizza establishment will use must focus on the particular program that you want your expected attendees to be aware of. 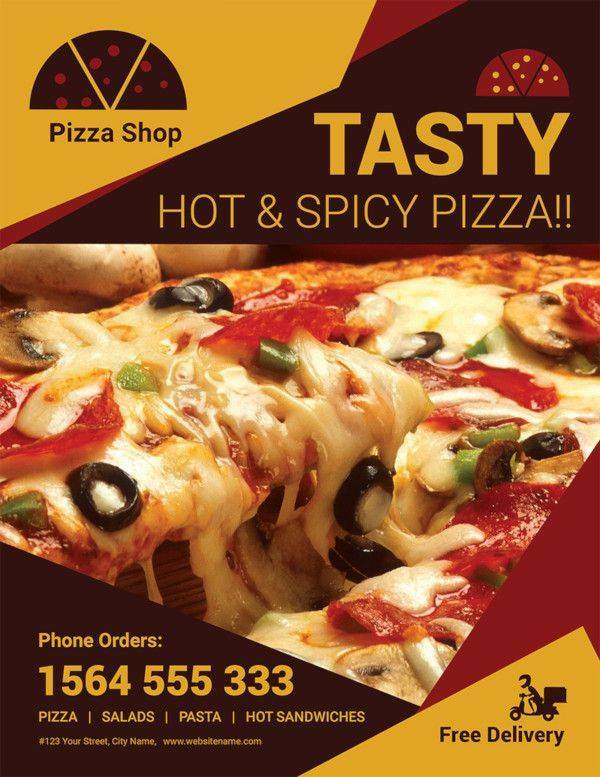 Make sure that the overall design of the pizza flyer has already been planned beforehand. 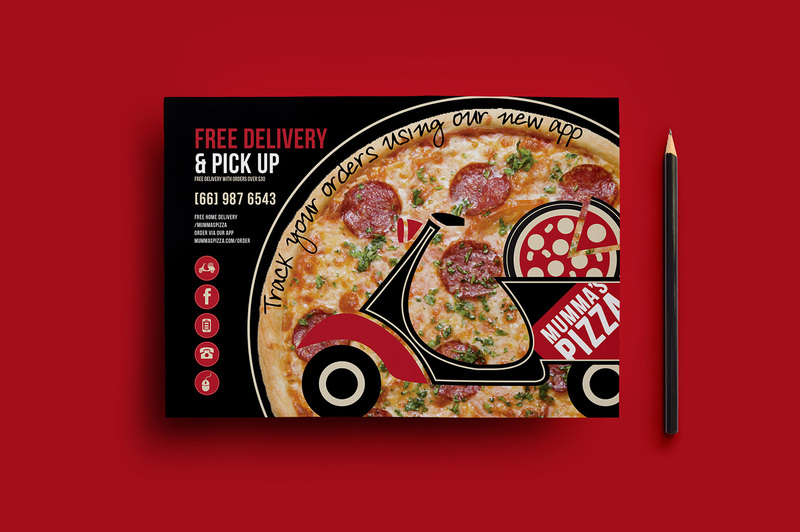 Though it is essential for you to be open to changes especially if it is for the betterment of the pizza flyer design, it will be easier for you if you already have an idea on how you would like your pizza flyer to look like. Ensure that the pizza flyer is cohesive. With all the items that you will put in a single layout, there is a high risk and a big chance for you to overdo things. Value the importance of blank spaces as these can help you create a properly put together design. Your pizza flyer is not just a document or a tool with a single purpose. If you want to come up with the best pizza flyers, make sure that they can deliver your corporate message to your customers. Always keep an eye on trends so you can also highlight them in your pizza flyer. So what are you waiting for? 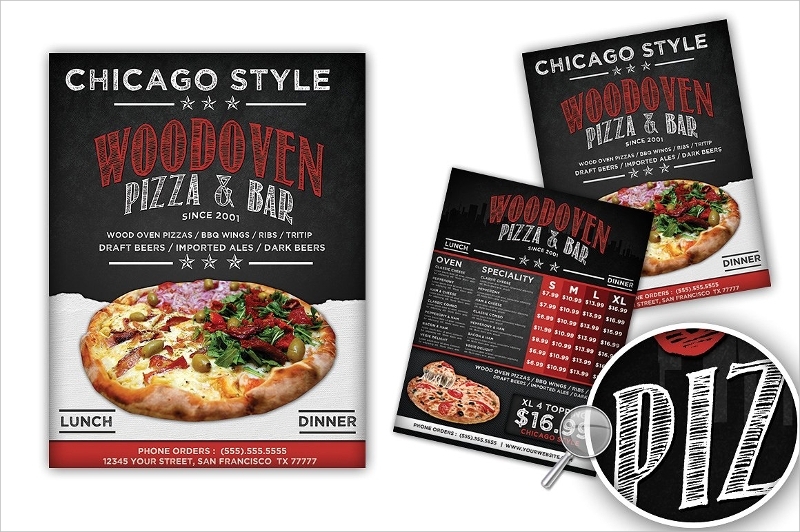 Invest in developing pizza flyers now and see how these tools can greatly affect your pizza establishment’s operations.